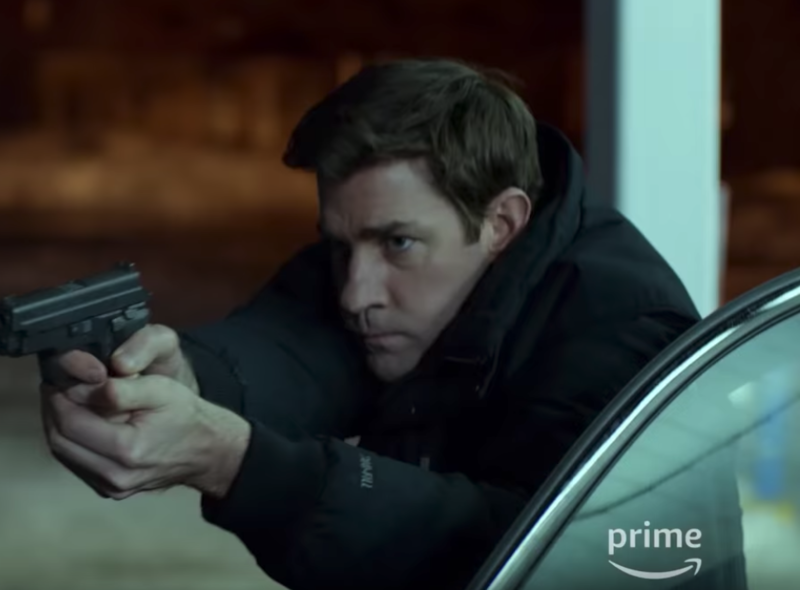 Fans of John Krasinski (The Office, 13 Hours) will have to wait a few moments to see him in Amazon Prime’s new action series Tom Clancy’s Jack Ryan. His introduction as CIA analyst Jack Ryan is preceded by a scene of two boys dancing to “Safety Dance” by Men Without Hats in 1983 Lebanon. Their laughter dissolves into fear as their city erupts in explosions from an air raid. 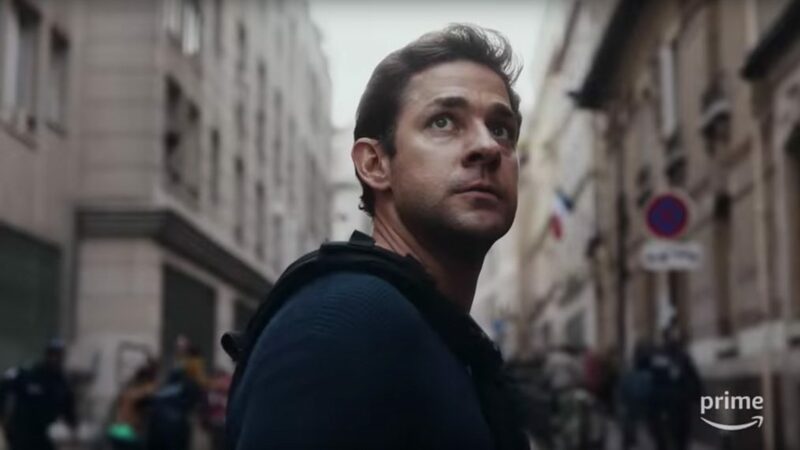 With this opener, Tom Clancy’s Jack Ryan is propelled forward into a premiere episode filled with intrigue, action, and—surprisingly—sobering reflections on the violence of war. Jack Ryan is not a James Bond or a Jason Bourne action hero. Since his directorial horror debut A Quiet Place (2018), Krasinski has been lauded as one to watch by critics and viewers alike. Long boxed in as Jim Halpert from The Office, this series is a great vehicle for Krasinski to show his range and extend beyond the confines of the charming paper salesman. Jack Ryan is not a James Bond or a Jason Bourne action hero. His story is grounded in reality, watching Jeopardy alone and nearly hitting his new boss’ car with his bike. But while the show first presents him as a likable every man, hints of Jack’s deeper wounds reveal themselves slowly through back scars and words left unsaid. The metronome by his bedside becomes a ticking time bomb as nightmarish flashbacks creep into his brain. Jack’s new superior James Greer (Wendell Pierce) digs through Jack’s past and finds evidence of his war background, including an article that reads, “12 Killed, 1 Survivor.” This trauma and survivor’s guilt helps explain Joe Mueller’s (Victor Slezak) examination of Jack as a “self-righteous boy scout.” Jack has a capabilities and ambitions of a hero, but is still burdened by a tragedy that sent him from a war zone to a desk. Rather than simply labeling Jack’s adversary as a villain, there is an emphasis on the complexity of humanity. From analyzing swift network transactions in Yemen, Jack pinpoints a target named Suleiman (Ali Suliman). Surely set to become Jack’s main antagonist for the series, we learn to fear him by the end of the episode. However, there is plenty of heft given to Suleiman’s past and family life, which humanizes him. Rather than simply labeling Jack’s adversary as a villain, there is an emphasis on the complexity of humanity. However, once the show becomes explosive, the action has a darker bend. A man pulls a disassembled weapon from the gaping chest of a corpse. A suicide bomber paves way for a bloody attack. A child singes his palms as he struggles to save his brother. Violence, pain, and war are all shown as one in the same. Greer is another kind of antagonist for Jack, and their working relationship faces immediate tension. Greer’s dismissive attitude towards Jack and his work only makes him more eager to prove him wrong. And Greer, who was recently, demoted, feels he has something to prove as well. There is wealth of dissonance set to unravel between Greer and Jack as the show unfolds. There is a sense that the series overall will also have a slow, but rewarding arc. Enough is set up in the first episode to leave viewers wanting more. Likewise, the exposition is woven cleanly throughout so that the influx of information doesn’t become overwhelming. In the premiere alone the hero, antagonist, love interest, and reluctant ally are introduced in quick succession. There’s a brief glimpse of Abbie Cornish as Cathy Mueller, an encounter that affects Ryan so strongly that he struggles to ask her out even as he is forced into a helicopter. Jack Ryan often feels like a slow burn; there’s a sense that the series overall will have a slow, but rewarding arc. With a phenomenal cast and the promise of good things to come, Amazon’s latest project could become the new Homeland. Meghan Cook is a comedy writer currently residing in North Carolina with one cat and fifty shows in her Netflix queue (that she will get to eventually).